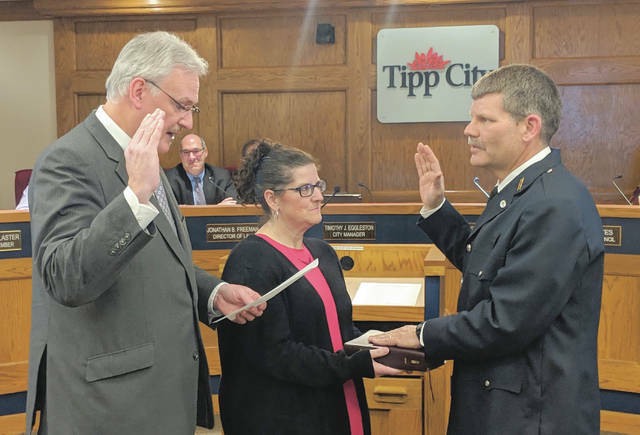 TIPP CITY — Cameron Haller was sworn in Monday night to serve as the new chief of the Tipp City Fire Department. Haller said he is thankful for the opportunity to join the department. “I’ve been diligently working to serve the citizens of the communities that I’ve represented in my career and I look forward with great pleasure to serve the citizens of Tipp City,” he told council. Haller served as deputy chief in the Sidney Fire Department for three years. He had been employed by the city of Sidney since 1995. He is a native of Van Wert and has lived in Sidney with his family for the last 23 years. Haller’s hiring was announced last December and he was introduced to the Tipp City department at that time. He waited to begin his new job in Tipp City so that his departure would not leave the Sidney department even more short-handed following the departure of one staff member and the death of another. Council welcomed Haller to Tipp City and thanked him for joining the department. “We hope that you have a good experience here. Council supports our police, our fire, our EMS and all those first responders. Best of luck,” Mayor Joe Gibson said. Haller succeeds Fire Chief Steve Kessler, who passed away last June after 50 years with the department. Last year, city council approved an ordinance setting the maximum biweekly salary for the new chief of fire and emergency services at $3,989.74. In other business, council approved the appropriation of $10,000 for the purchase of new turn-out gear for the fire department. The ordinance was passed as an emergency in order to put in an order for new gear quickly. City Manager Tim Eggleston said that flammable chemicals and waxes from the fire in the soap store last month damaged some of the turn-out gear worn by firefighters, making it unacceptable for use in the future.